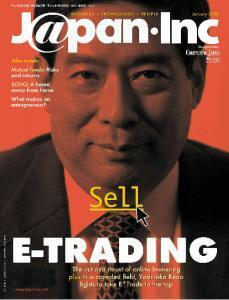 On the cover: Yoshitaka Kitao of Softbank and E*trade Trading covers: This month we offer a buy and sell option. Which did you get? E*Trade Japan was established early last year as a JV between Softbank and U.S. online securities trade giant E*Trade. Since then, a growing number of competitors have entered the fray, and the chances that any one player will dominate appear slim. The Tokyo Stock Exchange (TSE) launched a new stock market for venture companies called Mothers (Market of the High-growth and Emerging Stocks), in November 1999. When one writes on foreign companies in Japan, it is easy to invoke that popular metaphor of "Black Sheep" out on the horizon, thwarting long-standing trade barriers, real or imagined. When one writes on the American securities and brokerage firm Merrill Lynch, with asset totalling more than $1.5 trillion, one might as well skip the "Black Ship" idea and consider it an armada. As of November 1999, NTT DoCoMo had won more than 2 million subscribers for its i-mode telephone system-the world's first Internet services package offered via cellular phone. Attracted by this Net-savvy and affluent subscriber base, content providers have been rushing into bed with NTT, and by November 10, some 250 official and over 2,470 unofficial websites were i-mode enabled. Goldman Sachs made its first equity investment in a Japanese company in October 1999, selecting impress, a leading publisher of technology - and entertainment - related print and online magazines in Japan, as the recipient of some JPY 1.1 billion. The country is holding its breath for the birth of Japan's first virtual bank, scheduled to take place in 2000. The telecoms' battle over providing high-speed Internet access has heated up, with the main front now shifting to the local telecommunications market. You probably think of robots as machines that do some kind of useful work. AIBO the dog, however, does nothing of the kind. It sits, walks, wags, and plays-it even learns and grows (not physically, of course). Certainly not very useful, but this little guy's cute as a mechanical mutt can be. "Many women have a balancing act to perform-kids, work. The Net is the single technology that talks about shaking up the business environment for them," says Janet G.H. Ang, director, sales operations, Asia Pacific IBM. "The Internet is actually helping to level the playing field in many aspects for women." Launched on September 2, 1999, womenjapan.com is a coming-of-age site for the Japanese Internet. The decline in the rate of entrepreneurial startups in Japan has led to much weeping and gnashing of teeth in the media on how Japan is falling behind in the entrepreneurial race, especially versus the U.S. Opinions on the perceived causes of this are many-deficiencies in the educational system, societal constraints, lack of entrepreneurial spirit among Japanese, unfavorable banking practices, overly restrictive government regulations, a lack of funding, and so on.